The fruit that we have been eating since our childhood, and have loved for its texture and taste, has been known for its health properties recently. It is best added with curd rice, green gram sprout salad, fruit salad etc. Pomegranates are also used in cooking, baking, juices, smoothies and alcoholic beverages, such as martinis and wine. 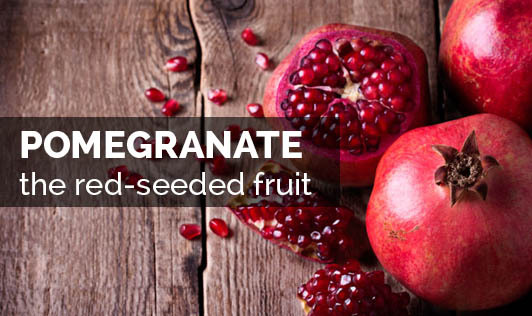 • Pomegranate is used as a traditional remedy against diarrhea, dysentery and intestinal parasites. • Pomegranate provides about 12% of the Daily Value (DV) for vitamin C and 16% DV for vitamin K per 100 g serving. And, hence is a good skin care remedy. • Pomegranate is an excellent source of dietary fiber, and hence can act as a very good mid morning snack for weight watchers. • It is also said that if pomegranate is eaten weekly once, it can reduce the level of LDL (bad cholesterol) if combined with regular exercises. • It contains anti-bacterial effects and hence can act as a barrier to dental carriers, infections, common cold etc. There is one common myth that I constantly hear about pomegranate that it is rich in iron because of its red colour. The fact is 100g of the fruit serves just about 5% of daily value intake of iron, which is about 0.8mg. Enjoy eating pomegranate weekly twice in different forms to get the best benefits from this super fruit!